I have waited so long for you. But not long enough! What are you doing here? Carmen Sánchez (née Rivera) is the deceased mother of Manolo Sánchez and the wife of Carlos Sánchez. She is a beautiful woman with brown hair with three streaks of white that curls at the end. She wears a simple black dress with a floral pattern on the bottom half and a red ribbon an sash tied around her waist. This dress is inspired by the state of Chiapas in Mexico. She also wears blue earrings and a blue pearl necklace with a heart-shaped pendant. When she was alive, she had light tan skin and brown eyes. Her appearance has not changed since she died, except that her flesh has gone, leaving her as a white calavera skeleton with black scleras and a glowing yellow pupils like all of the residents in The Land of the Remembered. Carmen is very spirited, yet stubborn woman who loves and cares deeply for her family. She is also shown to be quite feisty, stating that she would "get" Carlos once he arrives in the Land of the Remembered for persuading Manolo to become a Sánchez bullfighter against her wishes. She acts politely and respectful to those she holds in high regard, such as La Muerte, and she is also very courageous. This is shown when she accompanied her son Manolo on his journey to the Cave of Souls and the Land of the Forgotten despite the potential danger and risk as she wanted to be with him to help and protect him. She can and will stand up to those who have wronged her family, going so far as to slap Xibalba despite him being known to be extremely powerful. Carmen first appears in painted portraits during the beginning of the film, when Manolo and Carlos visit her grave. Manolo misses her very much, as does his father who also built a shrine to her inside their house. Though Manolo is more interested in singing and playing guitar, Carlos tells him that Carmen would have wanted him to be a bullfighter, like the rest of the Sánchez men. Several years after her death, Manolo reunites with her in the Land of The Remembered; after accepting being bitten by Más y Menos. Although she was happy to see her son again, she regrets that he died so young. Carmen reveals that she never liked bullfighting, motioning to the many other Sánchez men who died in the ring. Carmen introduces Manolo to the deceased members of the Sánchez family and guides him to the castle of La Muerte so that Manolo can ask her where Maria was. She is surprised to see that Xibalba is occupying the place that corresponds to La Muerte as ruler of the Land of The Remembered, although when he states that "she lost a bet", she agrees with the rest of the family; aware of the fondness of La Muerte for bets. Carmen tries to comfort Manolo when he discovers that he has fallen into the deceit of Xibalba, and that therefore Maria is still alive. She tries to convince him to stay with her and the rest of his family, but when Manolo insists that he will go to find La Muerte to return to the Land of the Living, she supports him and even accompanies him on his mission. Carlos was the former living husband of Carmen and father of their son, Manolo. Even after her death, her husband has never forgotten her or remarried, staying true to her and her memory. He visits her grave every year with Manolo on Dia de Los Muertos or The Day of the Dead. He even has a shrine of her in his house and talks to it, advising Manolo that his mother would want him to be a Sánchez bullfighter as a way to persuade him. When Carmen learns what Carlos said to Manolo, she says "He will get it when he comes down to the Land of the Remembered". This revealed that Carlos more or less used Manolo's love for his mother's memory to make him continue the Sánchez family tradition. When he is killed by Chakal and joins the Sánchez family ancestors as they watch Manolo bullfight against all of the bulls the family bullfighters have ever killed, she immediately hugs him, happy and full of joy to see him again after many years of separation. Manolo is the only child of Carmen and Carlos Sánchez. Manolo loves her despite the fact she died when he was an infant. The main reason he suppressed his desire to be a guitarrista and become a Sánchez bullfighter instead was because he believed it was what his mother would have wanted. However, she stated that she didn't want him to be one because of how very dangerous it is. The two immediately reconnected when they met again after many years of separation and she tagged along with Manolo during his journey as she did not want him to be alone or get injured. The two have a very positive, loving, caring relationship and care greatly for one another, refusing to let the other get harmed and only wanting what was best for each other. Luis is the deceased father of Carlos, the deceased father in law of Carmen and the deceased grandfather of Manolo. The two get along quite well, and she often carried his skull after it was separated from its skeleton. The two do not interact much but it can be assumed that given their relation to one another and how they behave around one another that they have a positive relationship. While she never spoke to or had direct contact with Maria, Manolo told his mom he had someone he wanted her to meet and told her she was going to love Maria. She attended their wedding and when she saw Maria's aggressive personality, she said Maria would make a great Sánchez, demonstrating that she approved of her. It is also interesting to note the two have very similar personalities, and it is hinted that this may be part of the reason Manolo is so attracted to Maria. She gets along well with all of the Sánchez family members and animator and director Jorge R. Gutierrez has stated she was created with a personality and strength of will that made her equal to the mortal men of the Sánchez family. She died protecting Manolo during the Mexican Revolution. Carmen was a cabaret singer and dancer in Mexico City when she met Carlos. Carmen is one of four daughters; all of her sisters became nurses. 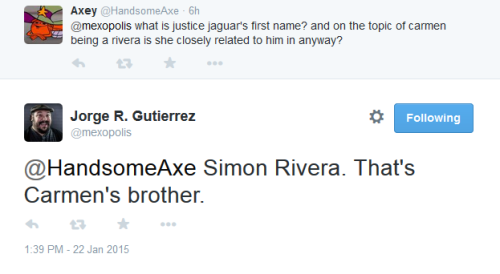 Carmen's maiden name was Rivera (later confirmed to be the same Riveras from El Tigre). Carlos built a shrine of her in the Sánchez household.